FebFast is going well. A couple of minor transgressions, but overall given I’ve normally got a bit of a sweet tooth, I think I’m doing well avoiding junk food. Certainly no chips or chocolate have passed my lips since the start of the month, but perhaps more remarkably, no biscuits (despite the plentiful supply in the office) and no muesli bars. Thank you to those who have sponsored me! If you’d like to contribute: here’s the link. Running is also going okay. I’m keeping up with at least three runs per week. I would like to go longer distances, and am scoping out some sports headphones (after the normal ones I used just fell out of my ears at speed!) I might adapt to RunKeeper’s interval training, as during my test run with music, the other problem apart from the headphones was I couldn’t keep count of my steps. Which brings me to the third tranche of my fitness regime: steps. I’m not into sport, but I love walking, and am blessed with a very walkable neighbourhood. With the app running, and given I take my phone almost everywhere I go, I can now very easily track the steps (and time) I take walking or running each day — excluding a small number of steps around the house or inside at work. The beauty of trying where easy/possible to go places without the car is that I get some exercise built into my day. For instance I have a short walk on each end of my daily train trip to work — this adds up to about 2000 steps. Add a moderate walk at lunchtime, and the trip back home, and I can easily exceed 6000 steps on a work day without even trying. On the nights that I don’t go running, I often take an evening walk with the kids. Depending on the weather and the errands we want to run (I often pick up supermarket supplies as part of this), this might typically be another 4000-5000 steps. Some days I walk less. Some days I walk more. My record in one day was this Sunday just gone, where a couple of walks down the street, plus a walk around Southland (another 5653 steps) and an evening run added up to a grand total of 15,796. Dr. Hatano’s calculations also showed that we should walk 10,000 steps a day to burn about 20% of our caloric intake through activity. (iv). 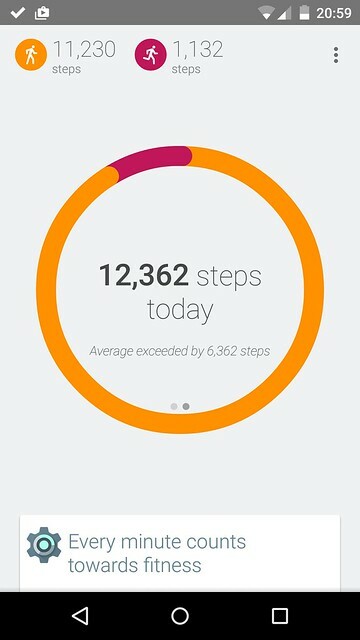 >or=10000 steps/day indicates the point that should be used to classify individuals as ‘active’. Individuals who take >12500 steps/day are likely to be classified as ‘highly active’. — How many steps/day are enough? Preliminary pedometer indices for public health. I’m thinking my aim should be to get to 70,000 steps or more in a week. Some days will be fewer than others, but if I can an average 10,000 per day, I’ll be doing pretty well. I’m not sure I can keep up that pace, especially through the winter, but I can try. At the moment, only a few phones have pedometers or other chips aimed at performing that function: these include the Google Nexus 5 that I have, as well as the Samsung Galaxy S5, and the iPhone 5s and iPhone 6. The other alternative of course is an actual pedometer, or a fancier device such as a FitBit, or other devices with a pedometer such as a Nintendo DS. I am truly impressed by your efforts. It would be interesting to see if your doctor can measure any (positive) change in your health – perhaps you are still too young for an improvement to show up. My only word of caution given your love of technology when you are pounding the pavement is to concentrate on your environment using all your senses or you could end up like poor Josie Edden.